It’s been a long, chilly, and rainy winter, and I just can’t wait for spring and summer. To help me get over the hump of waiting, I thought I might treat myself to a hot meal at a cozy restaurant. 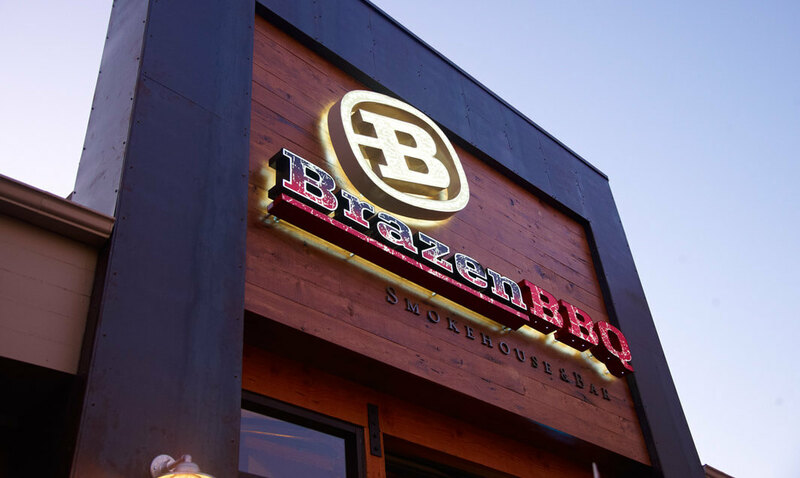 This led me to Brazen BBQ in Hillcrest, on the corner of 5th and Washington. Because I’m not a fan of large or noisy crowds, I timed my trip to just before their dinner rush, and before their small, yet practical parking became full. When you walk inside, you’ll witness a large spacious restaurant and front and center behind the counter is a large meat smoker. In the middle of the restaurant, there’s an epic hand-washing station, which I was able to appreciate personally because at the end of the day, eating bbq ribs gets messy, and it’s nice not having to enter a restroom just to wash your hands! 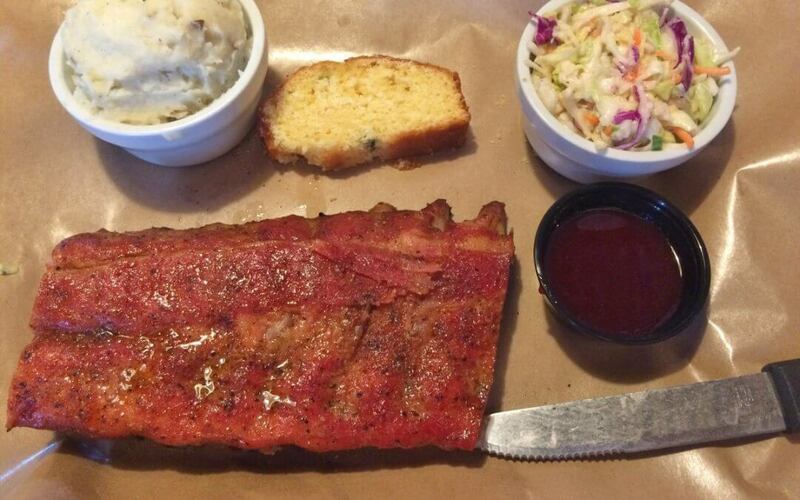 Sometimes you just need to treat yourself, you know — to a half rack of baby back ribs, with peach cobbler on the side. Brazen BBQ is known for ribs, so ribs are what I ordered. To get the best of both worlds, I ordered the dry rub baby back ribs with a side of their “Competition Sauce.” This way, I could savor the meat and rub alone, and also experience it bathed in BBQ sauce. The pink meat fell right off the bones, and I could have eaten it all without the Competition sauce, but once I dipped into the sauce, I couldn’t stop. They choose a great name for their BBQ sauce because out there in the BBQ sauce space — it’s a competition! It takes one teeny tiny taste to realize it’s one of the best BBQ sauces out there. The rub is made in-house, and the ribs are smoked in-house for 5-6 hours, per their Pitmaster, John Bracamonte. 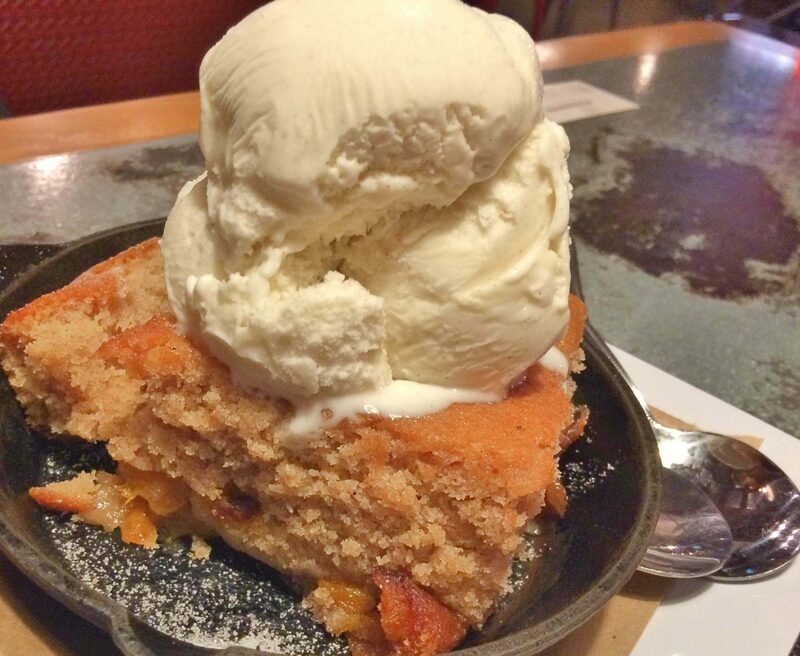 I devoured half of a half rack of ribs, and was ready for warm peach cobbler ala mode. The peach cobbler was huge. Unlike many cobblers I’ve had before, this cobbler had a light, fluffy loaf of cake, and wasn’t overly sweet. It was savory and balanced, and the vanilla ice cream was excellent. What are you waiting for? Treat yourself to ribs and peach cobbler!